Full Price: $ 14995.00 60% off! 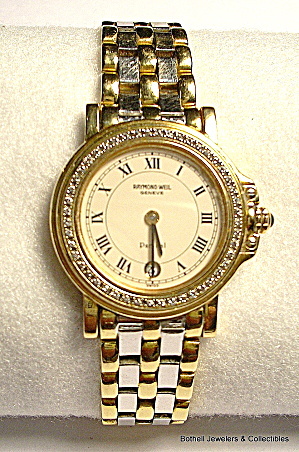 'Raymond Weil' Geneve 'Parsifal' Swiss made 18 karat yellow and white gold lady's wristwatch in excellent mechanical and outer condition with a quartz movement and date window. It has approximately fifty (50) small full cut diamonds around the dial, and a beautiful two tone design. Marking on back of the case reads '18K' and '18K750' on the band and measures 6.5 inches long. This watch has over 50 grams of solid 18K gold, not counting the movement, and would sell new for about $15,000.00. This is a beautiful and exquisite watch in a simple elegant design now selling below current wholesale cost! Click on the thumbnail picture for other views (Color does not show very well in the photos but it is a really beautiful piece!). $12.50 shipping and insurance charge for this item in the U.S. This is a rare buy!